The ability of the human body to process nutrients and convert this input to energy and raw materials for our cells is truly remarkable. From a biohacker's point-of-view, modulation of metabolism by diet/intermittent-fasting, and exercise are powerful ways to modulate one's metabolic state. Metabolic activites are carried out in virtually every cell, in every tissue of the body. However, there is a lot of individual variability in metabolism. For example, a recent paper in Cell showed that increases in blood glucose after identical meals differs hugely among individuals.﻿﻿﻿﻿1﻿﻿﻿﻿This indicates that blanket recommendations for diet may fall short for many individuals, and greater personalization of nutritional recommendations should be the norm. Furthermore, many chronic diseases have their roots in metabolic dysfunction. To this end, we will describe some basic anatomical and cellular constituents of human metabolism, and steps that can be taken to modulate your metabolism. While the entire body participates in the metabolic process, there are several key organ systems that play particularly important roles as reservoirs of energy, that are mobilized when blood glucose levels fall. In particular, the body's adipose tissue (fat), liver, and muscles are important sites of metabolic activity and reserves of energy. During fasting, energy is provided to the body in several ways. Glycogen (branched chains of glucose molecules) stores in the liver are mobilized to increase glucose in the blood stream. Fatty acids stored in adipose tissue, are broken down and transported throughout the body. These fatty acids are either made into glucose, or are converted into ketone bodies. 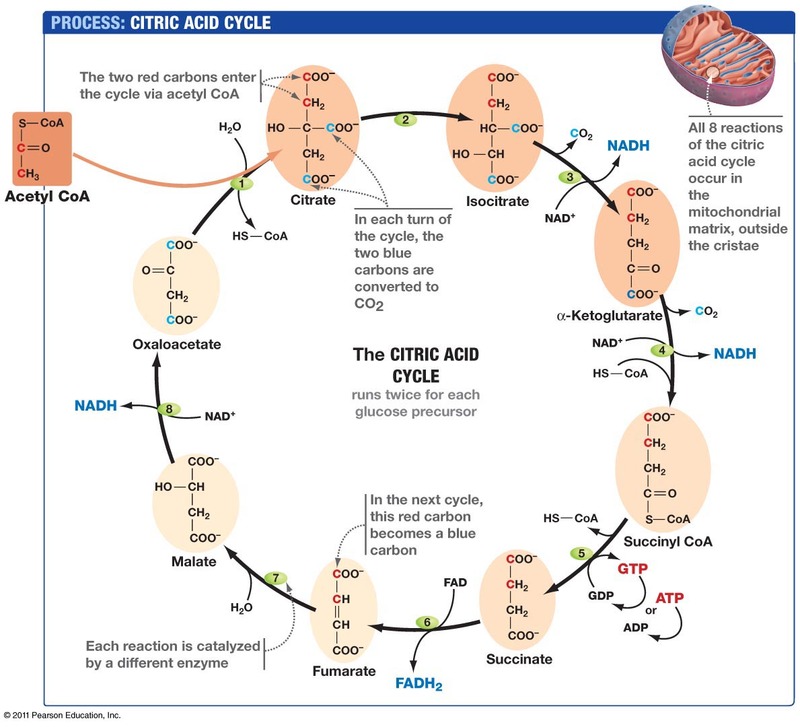 These ketone bodies are very efficiently used in the Citric Acid Cycle (described below) to produce energy. Free glucose in the blood is not directly utilized as energy by the cell. Rather, ATP is the final "energy currency" in biological circuits. 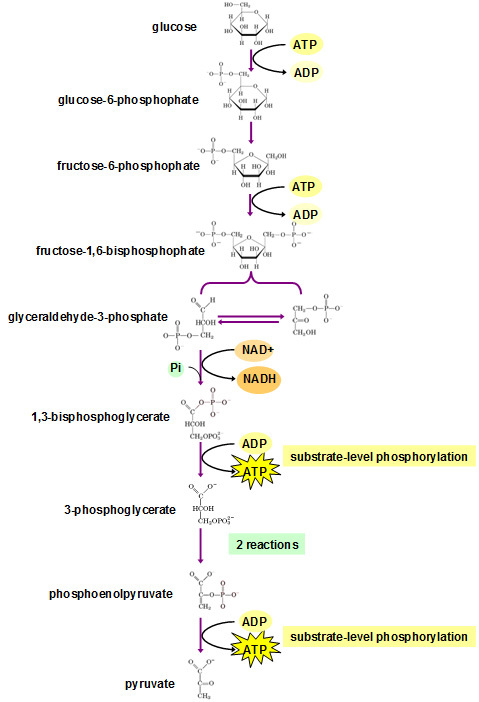 The production of ATP from glucose proceeds through several cellular processes: glycolysis, wherein glucose is broken down into pyruvate; pyruvate is converted to acetyl-CoA (not pictured); the citric acid cycle produces NADH; and this NADH is sent through the electron transport chain, where the H+ ions are stripped from NADH, and used to produce ATP through an elaborate mechanism. 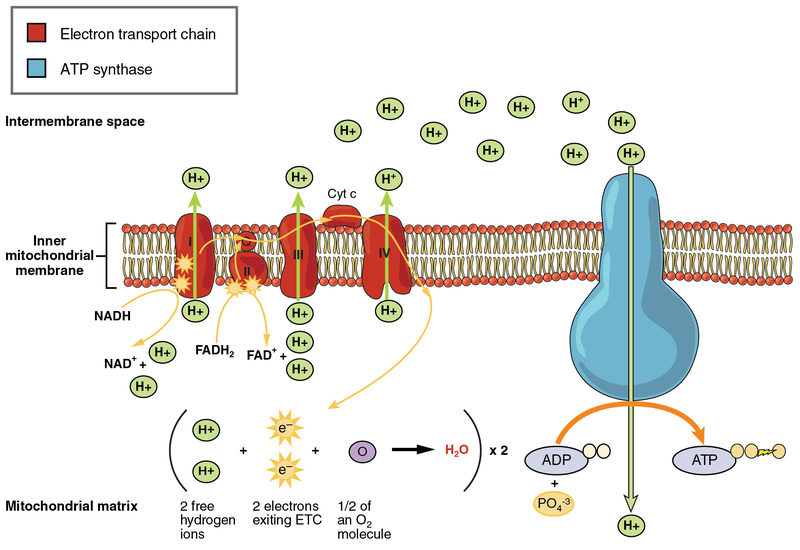 This breakdown of glucose and the electron transport chain are perhaps the most well-defined biological processes. A full treatment of this process is by no means presented; however, it is easy to appreciate just how complex the metabolism of glucose is, and how many different proteins play important roles. And it is likely natural genetic variation in the function of these proteins, and experience-dependent modulation of these proteins, contributes to individual differences in metabolism. 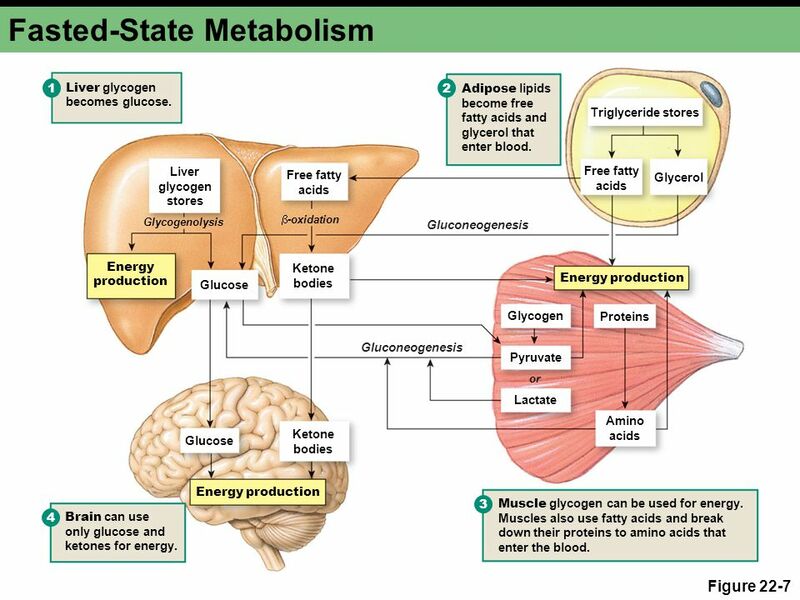 A person's metabolic state are influenced by various factors such as nutrition and exercise. The complex interplay of these factors have effects on cognition as well as prevention from various chronic diseases and conditions such as heart disease and metabolic syndrome. The powerful influence of our diet on our cognitive processes is just starting to be discovered. Advances in molecular biology are allowing us to uncover how certain nutrients can support the function of synapses - the neuron-to-neuron junctions that are the basis of the nervous system, and improve cognitive performance. In particular, supplementation with omega-3 fatty acids such as DHA can modulate neuronal signaling, and preliminary evidence suggests DHA may improve cognitive function. Metabolism is also closely linked with aging at a cellular level. In particular, the efficiency of mitochondria, the powerhouse of the cell, are closely linked with aging. There are several strategies for modulating metabolism, including variations of fasting, exercise and dieting.